When it comes to budget wedding decorations, we always suggest to minimize the flowers and go for more drapes and lights. This will help to keep the cost in control. Some may wonder if drapes would go well for a traditional Indian wedding. My answer is “Yes”. It is all in the way we design , colour of drapes and lightings. 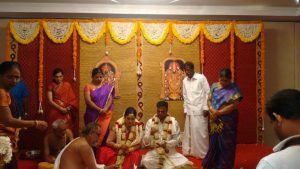 If you want to go Hindu conservative style, the best choice will be light golden colour drapes with a yellow or white lightings. This will make the stage looks grand. There can also be addition of very few seasonal flowers. In case of other Christian wedding it is better to go with white drapes and add little of rose flowers . For Muslim wedding the gold or light blue or white will go well along with the lighting of the choice . Another important factor of cost reduction is the dimensions. 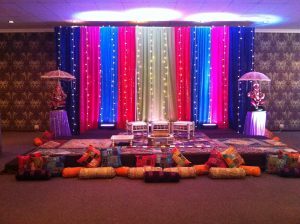 It is better to go with only backdrop kind of setup than a pillar style projected decoration. 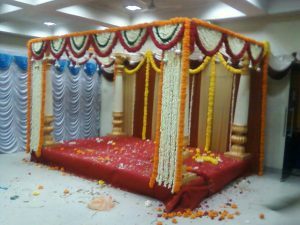 Below are some good samples of budget wedding decoration. you may call us at 9841079573 to know more..